which depend on the former two contracts. There might also be an additional contract to facilitate the onboarding of new Raiden users, which has been called “Hub Contract” in some discussions. There are no detailed plans for that contract, yet. The ServiceRegistry provides a registry in which services have to register before becoming a full part of the Raiden services system. Services have to deposit RDN tokens in this contract for a successful registration. This avoids attacks using a large number of services and increases the incentive for service provider to not harm the Raiden ecosystem. The Raiden services will ask for payment in RDN. 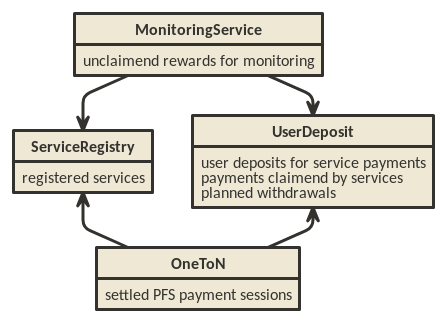 The Monitoring Service and the Pathfinding Service require deposits to be made in advance of service usage. These deposits are handled by the User Deposit Contract. Usage of the deposit for payments is not safe from double spending, but measures can be taken to reduce the likelihood to acceptable levels. This is a good trade off as long as the money lost on double spending is less than the savings in gas cost. Users can deposit and withdraw tokens. Tokens can be deposited to the benefit of other users. This could facilitate onboarding of new Raiden users and allow a MS to defer the monitoring to another MS.
Tokens can’t be withdrawn immediately, but only after a certain delay. This allows services to claim their deserved payments before the withdraw takes place. Service contracts are trusted and can claim tokens for the service providers. Services can listen to events which notify them of decreasing user balances. A service can then claim payments before double spending becomes too likely. The MS is promised a reward for each settlement in which it took part on behalf of the non-closing participant. Before accepting a monitor request, the MS checks if enough tokens are deposited in the UDC. The MS that has submit the latest BP upon settlement will receive the promised tokens on it’s UDC balance. The PFS will be paid with signed IOUs, roughly a simplified uRaiden adapted to 1-n payments. The IOU contains the amount of tokens that can be claimed from the signer’s UDC balance. See OneToN for details. The concept is based on the idea to use a user’s single deposit in the UDC as a security deposit for off-chain payments to all PFSs. The client sends an IOU consisting of (sender, receiver, amount, expiration, signature) to the PFS with every path finding request. The PFS verifies the IOU and checks that amount >= prev_amount + pfs_fee. At any time, the PFS can claim the payment by submitting the IOU on-chain. Afterwards, no further IOU with the same (sender, receiver, expiration) can be claimed. Is the PFS the receiver? If one of the conditions is not met, a corresponding error message is returned and the client can try to submit a request with a proper IOU or try a different PFS. Otherwise, the PFS returns the requested routes as described in the current spec and saves the latest IOU for this (sender, expiration_block). You can use raiden_contracts.utils.sign_one_to_n_iou to generate such a signature. A OneToN contract (OTNC) which is trusted by the UDC accepts IOUs (see table above for parameters) and uses the UDC to transfer amount from sender to receiver. The OTNC stores a mapping hash(receiver, sender, expiration_block) => expiration_block to make sure that each IOU can only be claimed once. To make claims more gas efficient, multiple claims can be done in a single transaction and expired claims can be removed from the storage. Combined with the sender and receiver fields it identifies a single payment session. Under this identifier, multiple payments are aggregated by continuously increasing the amount and only a single on-chain transaction is needed to claim the total payment sum. After claiming, the identifier is stored on-chain and used to prevent the receiver from claiming the same payments, again. When old IOUs have expired (current_block > expiration_block), the sender can be sure that he won’t have to pay this IOU. So after waiting for expiry, the sender knows that IOUs which have been lost for some reason (e.g. disk failure) won’t be redeemed and does not have to prepare for unpredictable claims of very old IOUs. Entries can be deleted from the hash(receiver, sender, expiration_block) => expiration_block mapping which is used to prevent double claims after expiry. This frees blockchain storage and thereby reduces gas costs. Users can’t immediately withdraw tokens from the UDC. They first have to announce their intention and then wait until a withdraw delay has elapsed. Only PFSs registered in the ServiceRegistry are allowed to claim IOUs. This is important because claims allow circumventing the UDC’s withdraw delay. Called by a registered MS, when providing a new balance proof to a monitored channel. Can be called multiple times by different registered MSs as long as the BP provided is newer than the current newest registered BP. token_network_address – Address of the Token Network in which the channel being monitored exists.